*For those following along with the 8-trick Pocket Hat KAL, there are no pattern instructions in today's post. Rather, this is a general post about how to make ribbing without those icky dots, a trick which will be used on the hats in a future installment. READ THIS NOTE BEFORE YOU READ THIS POST!!! 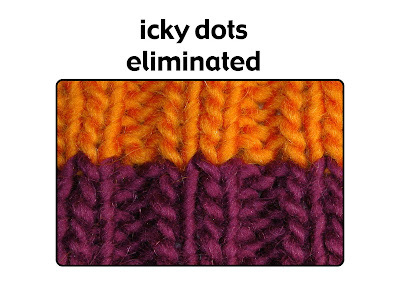 This post explains where the contrasting-color blips ("icky dots") come from when you change color in knitting a textured fabric such as ribbing. The post also offers a fix for the problem. That fix is going to work really well IF you are knitting a non-reversible garment, meaning one which is going to wind up with AN INSIDE and an OUTSIDE. 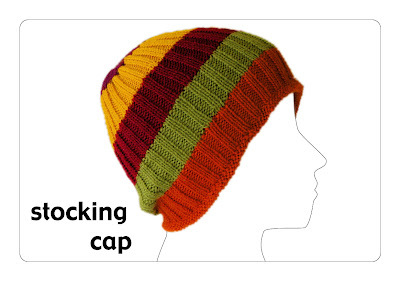 Examples are circular-knit items like the 8-trick pocket hat of this KAL or a sock, OR an item knit flat and then seamed, such as a pullover sweater knit in pieces and then sewed together. This trick will NOT WORK for a reversible item, such as a flat-knit neck scarf. This is because the fix moves the contrast color dot to the inside fabric face. If both fabric faces are the "outside" (reversible item) there is no "inside fabric face," so the fix offered in this post doesn't apply. Knitting contains many mysteries. This blog has already tackled one big mystery: why knitting curls (answer here). Today: another great mystery--why knitting in more than one color, such as stripes, makes ICKY DOTS in ribbing. Icky dots aren't confined to ribbing. They actually show up when you change the color in ANY sort of texture work. Today's post is split into two sections. The first section (with gold-dot illustrations) is general background about color and texture. The second part (with rust-colored-dot illustrations) applies this general knowledge to getting rid of dots in ribbing. If theory and reasons don't attract you today, you can skip down to the bottom of this post for the fix. We know that changing color in all all-knit fabric such as stockinette yields smooth un-dotted stripes. So icky dots which appear at a color change must have something to do with purls. But what aspect of purls creates icky dots? In the finest tradition of scholarship, I'm going to answer that question with a second question. How would you make a single line of orange purls running across a brown background of stockinette? By figuring out the answer to this second question, we'll be on the way to avoiding icky dots. Looking at color, then texture, and then combining will yield the answer. When you change a color, you are changing the color in the CURRENT row. Seems simple enough, but let's look at this one more time. To make the current stitch, the tip of the RIGHT (working) needle pulls a loop through the stitch at the tip of the LEFT (holding) needle. This newly-pulled-through loop lays on the tip of the RIGHT needle when it is formed and joins the rest of the current row. All these stitches in this current row LAY IN LOOPS on the right (working) needle. 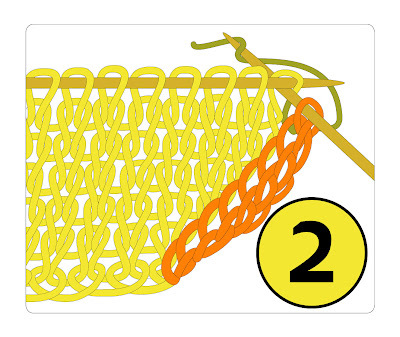 Illustration 1, below, shows a new row half-knitted: on this stockinette fabric (no texture) the NEW row being created in orange is partially knit, and lays in loops over the right needle. 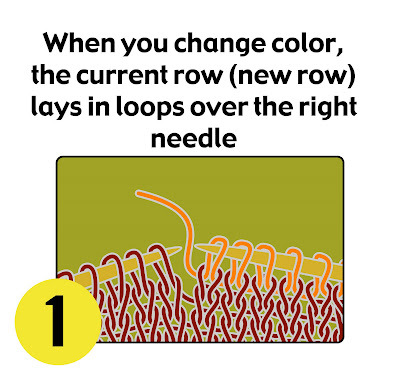 The left half of the OLD row is in brown over the left (holding) needle, while the right half of the OLD row has become the first row of fabric, which lays UNDER the orange loops on the right (working) needle. To sum this up, here's the first chunk of red text: when we change COLOR, we are affecting the stitches in the CURRENT row--the row laying in loops on the right needle. For the purpose of this post, we'll say that a stitch has three parts. 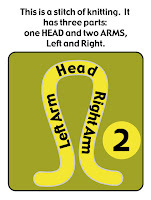 As shown in illustration 2, these parts are one HEAD, and two ARMS, Left and Right. In the context of knitted fabric, "texture" refers to knitting and purling. Naming the texture of a knitted fabric is just a way of saying whether the HEAD or the ARMS of the stitch are predominant. "Creating texture" is what happens when you switch from knitting, for example, to purling. So, in illustration 5, below, the knitter is purling every second stitch on an otherwise all-knit (stockinette fabric) background. In terms of heads and arms, the heads of the purl stitches are being popped out onto the face of the fabric. This creates a texture pattern: a row where individual purl stitches stand out on a stockinette background. There are two important things about this process of pulling a new loop through an old loop. First: the newly-purled stitches appear in the right portion of the OLD ROW. In other words, the new purls appear ONLY on the right side of the old row BELOW the partially-knitted current row--they have joined the knitted fabric and lie in the right part of the old row BELOW THE RIGHT NEEDLE. Second, the loops of the current row, as well the unworked stitches on the left side of the old row aren't knits OR purls. They are not yet part of the fabric, and they are blanks. These unworked stitches (loops over the needle) won't join the fabric as knits OR purls until a new loop has been pulled through THEM. Yes, as surprising as this is, when you knit or purl a stitch, you're really knitting and purling the OLD stitch in the row BELOW the stitch you just made. This is a pretty important point for all of knitting, worth repeating a little bit. If you scroll up and look at illustration 5 again, you will see lots of loops. The left needle is holding the loops waiting to be worked, the right needle is holding the loops of the current row you've just made. But none of these loops are part of the fabric yet. The orientation of these loops won't be determined until new loops are pulled through THEM, pinning them into the fabric either in the knit position (arms forward and heads back) or in the purl position (heads forward and arms back). Loops laying over a needle are not worked into the fabric, and they are neither knit stitches or purl, but are blanks! We'll sum this up in a second chunk of red text: In creating texture, we affect the stitches in the row BELOW the current row. In other words, we are affecting those stitches in the OLD row where the old row lies BELOW the right needle. Now that we understand in which row color changes, and in which row texture changes, we are ready to answer the question at the top of this post: how would you purl a line of orange on a maroon background? 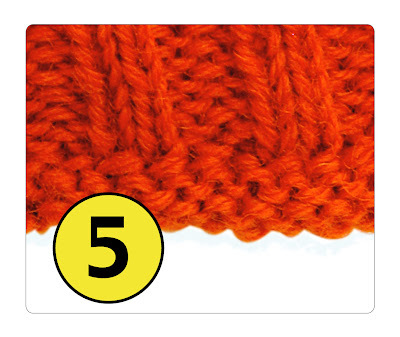 First, on the face of the stockinette fabric, we'd have to KNIT a row of orange, which puts color into the current row. Then, on the NEXT row of the fabric, we'd have to work these orange stitches as necessary to impart a purl texture to them when they are viewed from the smooth "knit" side--we'd purl them if working in the round, but we'd knit them if working back and forth. Part 2: Eliminating icky dots in ribbing. We've established that color changes in the current row, but texture changes in the part of the old row below the right needle. 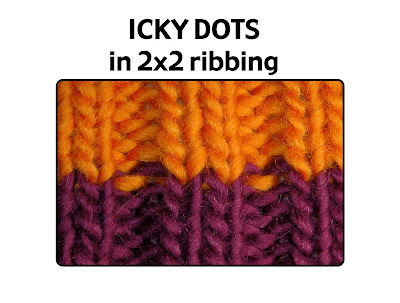 In this second half of the post, we'll apply this new knowledge to eliminating those icky dots in a 2x2 (k2, p2) ribbing. *reminder: The illustrations in this half of the post are numbered with RUST-COLORED dots. Illustration 1, below, shows a new color (orange) being purled onto the right needle. As we established above, purling with the new color is NOT the way to add a new row of a new color, and this illustration shows why: purling pops the heads of the ROW BELOW to the surface of the fabric. In fact, that's what the icky dots ARE: They are the contrasting color purl heads of the row below, as you can see at the arrows. Illustration 2 is a closeup: Now it's easy to see that using the new color to purl the purls in ribbing makes the purled head of the old color show as an icky dot. The next 2 illustrations below, 3a (overview) and 3b (closeup), have the keys to the mystery of creating ribbing without the icky dots. Specifically, if you KNIT with the new color, even in the purl rows, the dots will be eliminated. See what we did? We SUBSTITUTED texture change for color change! 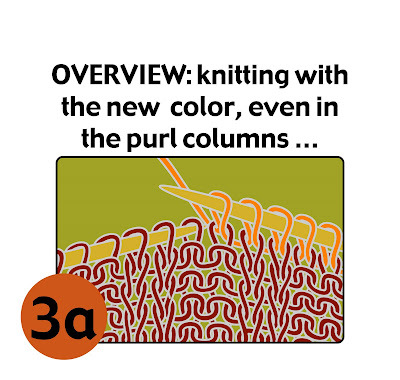 Specifically, the top brown stitches in the purl columns (the two columns on the right side of illustrations 3a and 3b) are now knit stitches, and knit stitches, as we know, don't show any icky dots where they change color. 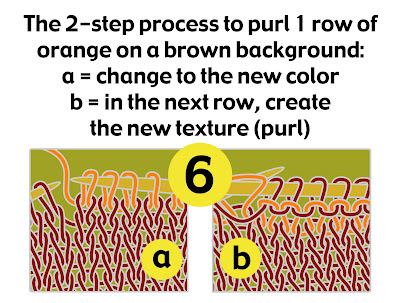 The tricky thing is that, as illustration 3b shows, we return to the purl pattern by purling the purl columns in the SECOND row of orange, and this imparts the purl texture to the FIRST row of orange, as explained in part 1 of this post. Now, in knitting, as in all other fields of life, there is no free lunch. Knitting across the tops of the purl columns eliminates the color change--the icky dots--but, this comes at the price of interrupting the texture of the purl columns. This price, however, is low. In other words, the trade-off of texture-disruption for dot-elimination is a pretty good one. 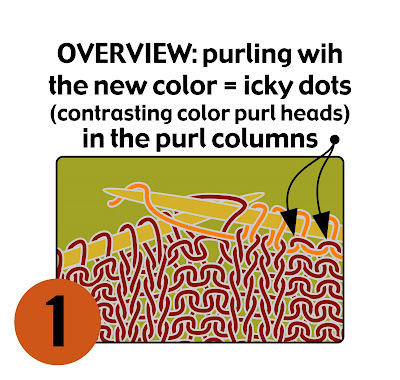 The icky dots (color change) are easy to see, but the texture change is hard to see: it is hiding in the receding purl columns, as shown by the closeup in illustration 4. Of course, this illustration can't give you a feel of the fabric, and knitting across the purl columns at the color-change row leaves a little bump, but it's not much of a bump, and blocking usually smooths that right out. The only other price is a slight tendency to want to fold along each color change, but on a garment being worn, you will never notice this: only when you go to put it away does it feel slightly floppy. What a lot of words and pictures! KNIT all the stitches of the new color, all the way across the whole fabric, ignoring the texture changes (purls) of that row. So, for ribbing, on the color change row, just knit all the way across--no purling, just knitting. On the next row as you work the loops of the new color, RETURN TO YOUR TEXTURE PATTERN. So, for ribbing, once you've completed the color change row and are on the second row of the new color, return to purling in the purl columns and knitting in the knit columns. This imparts the correct texture to the stitches in the first color change row, and hides the knit stitches on the inside of the garment. Here is one last photo: 2x2 ribbing with the icky dots eliminated. Looks a lot better than the first photo of this post, ay? You have been reading TECHknitting on "eliminating dots in ribbing: purling in color"
ADDENDUM, 2011: The KAL laid out below stretches out over 5 posts, of which this is second, and is free. However, some folks have written to say they find it hard to follow the pattern over so many posts. So...if you like, you can buy the pattern in an easy-to-print, all-in-one place pdf (click here). Today's trick is a nice little rim-like edging at the cast-on edge, very easy to do, which will stretch and never bind--very good for the edge of a hat, or the neck of a top-down sweater, or the top of a top-down sock. The top half of this post gives the general instructions for this easy-peasy edging while the bottom half applies this edging to the POCKET HATS introduced in the previous post. This edging--a reverse stockinette tubular edging--is pretty much the same as the knitted-shut hem, which was posted here. However, there are two important differences. Second, when caught into a tube, reverse stockinette wants to protrude and stretch outwards, sort of like a rolled edging (scroll link for a gallery of rolled edges). In fact, reverse stockinette tubular edging is the same thing as rolled edging except that the roll-edge knit shut in this edging. By contrast, a knit-shut hem might want to flip up, but it generally does not stretch out like this edging does. Illustration 1 (below) Cast on by the long-tail method, as many stitches as you need (If you are making the pocket hat, the pattern and number of stitches to cast on is the bottom half of this post.) Knit somewhere between 4 and 8 (or even more) rows or rounds of stockinette fabric. If you are knitting flat (back and forth), end by working a purl row, so that when you turn, you will be on the smooth "knit" side of your fabric. With the right needle, follow the column down to the cast-on loop, and inset the right needle into this loop. Next, insert the right needle into first stitch on the left needle, so that two loops are on the right needle--the cast-on loop from the bottom of the column, and the stitch at the top of the column, which lay on the left needle. Using the running yarn (also called the working yarn) knit these two loops together. In the illustration below, the running yarn (working yarn) is shown in green, although in real life, of course, this yarn would be the same color as the fabric. 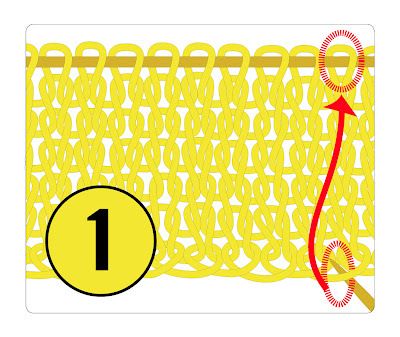 Illustration 3 (below) Continue in this manner around the round, or across the row until all the loops and stitches are knit together. In other words, continue until all the column-bottoms are knit together with the column-tops. The reverse stockinette side of the fabric (orange in this illustration) shows on the outside of the little tube you have just fabricated. Again, in real life, the orange (reverse stockinette tube-outside) the yellow (stockinette tube-inside) and the green (running/working yarn tube-closure) would all be the same color. The illustration shows them in different colors just to make it easier to follow. 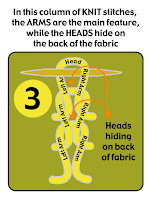 Illustration 4 (below) On the next round or row, begin the garment fabric. 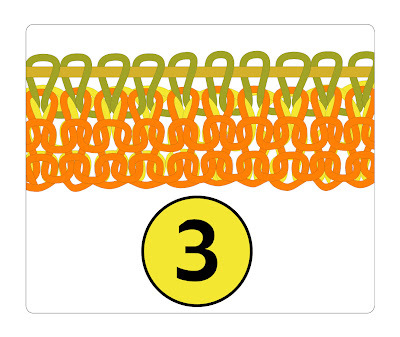 In this illustration, the garment fabric is a 2x2 ribbing (k2, p2). illustration 5 (below) Here is the result "in the wool." 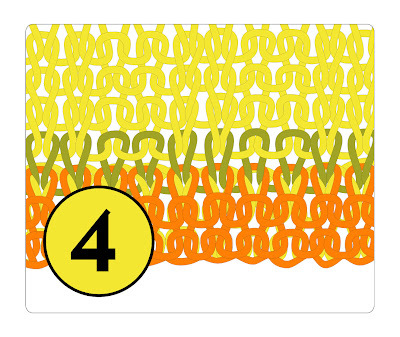 This illustration shows an 6-round reverse stockinette tubular edging on a 2x2 ribbing, which is the same fabric and edging illustrated in 1-4. One last note before we turn to the hat pattern: When used for negative ease garments such as socks, hats and mittens, the reverse-stockinette tubular edging will make these garments flare along their lower edges. As you can see from the opening photograph in this series, the pocket hats which start with this edging lay in a bell-like shape when they are flat. However, as soon as the garment is put on, this edging looks very well. On hats, (illustration 6, below) this edging makes a pleasant little brim. If you want to use this cast-on, but do not want a brim, make the edging on few rows, maybe as few as 2. Alternatively, remember that this cast on is tubular--a tube of 4 or 6 or more rows can serve as a little casing into which you can insert an elastic or a draw-cord. for persons with freakishly large heads (such as my husband, who has a 23 1/2 inch head circumference) cast on 121. Remember--this is ribbing and will stretch significantly. 2. Using the TECHjoin method, join the cast on. The TECHjoin method prevents that nasty little "jog" at the beginning of the round. It also consumes one stitch. After joining, you should have 116 stitches for the normal size and 120 stitches for the super-size. Place a marker after the join. 3. Knit 4-8 (or even more) additional rounds. The fewer rounds you knit, the less bell-shaped the hat will be laying flat, the more rounds you knit, the more "brim-like" this edging will be when you wear the hat. 4. According the edging instructions in the first part of this post, use your right needle to catch the cast-on loop for each column, and knit both the loop and the stitch together. 5. 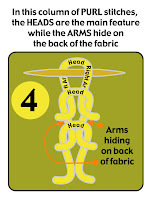 Continue in this manner until you have knit together all the way around. When you come to the marker, remove the marker then SLIP the next stitch, then replace the marker. This little maneuver of slipping the stitch will prevent a jog where the knitting-together ends, and it moves the round-beginning one stitch to the left. 6. Establish a k2, p2 pattern of ribbing around the hat. 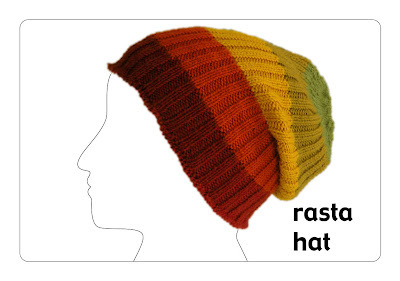 As discussed in the last post, this hat comes in three lengths, watch cap, stocking cap and rasta-style hat. As you knit this stripe, keep the marker in the same location, simply slipping it from left needle to right each time you meet it. Includes 6 illustrations. Click on any illustration to enlarge. ADDENDUM, 2011: The KAL laid out below stretches out over 5 posts, and is free. However, some folks have written to say they find it hard to follow the pattern over so many posts. So...if you like, you can buy the pattern in an easy-to-print, all-in-one place pdf. Several themes have popped up lately at chez TECH. The little kids around here keep actually losing their hats, and the big kids keep claiming they're "losing" theirs. Various threads on Ravelry show the depths of despair knitters are feeling about getting gauge, and particularly, row gauge. I've been saving up a grab-bag of tricks to share-- a truly flat top for a hat, a ribbed fabric without any icky little "dots" showing on the front of the fabric, an easy-peasy way to start a garment with a stretchy edge--a trick so methodical you can start a garment at a meeting. Knitting away over the past few days, all three themes came together in a series of little hats, quick to make. I call these little numbers "pocket hats" because they are small enough to slip into a pocket as a spare hat, until a good stiff windchill reminds even careless little kids and hair-conscious teenagers that frozen ears=bad, hat=good. 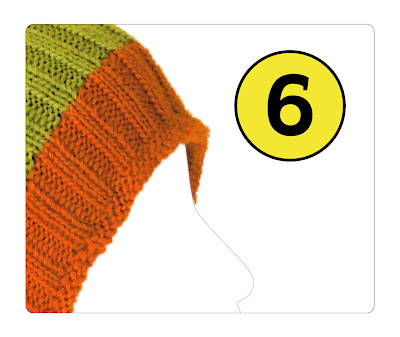 Pocket hats are easy in the gauge department: they're made in 2x2 ribbing, a fabric very forgiving of stitch gauge. Also, they are made in three different lengths. Even if your row gauge is wildly off, you should nevertheless get a wearable hat somewhere in this range of offerings. As to the grab-bag of tricks, there are 8 of them, and each post in this series will first lay out one or two of these tricks, and then apply that trick to the hat. The next post after this one will show how to make the easy-peasy cast on: a reverse stockinette tubular cast on, which will immediately be put to use as the hat brim. Following posts will show jogless stripes and working in tails as-you-go as adapted for 2x2 ribbing--and also how to knit a ribbed material without "dots." The later posts will lay out that nice flat hat top I promised, which incorporates three tricks on its own account. The series will end with two tricks to help tame "itchy-wool-against-the forehead" syndrome, for 8 tricks in all--the 8-trick pocket hat. The series can be read like a little knit-along (KAL). However, even if you have no need for a hat at present, the tricks will be written up in the first portion of each post in this series. The theory of gauge is simple enough: Suppose you want to achieve a GAUGE of 6 stitches to one inch, and 8 rows to one inch. You gather your yarn, and select the needles which experience has taught you to expect may be the correct size, and you knit a swatch. 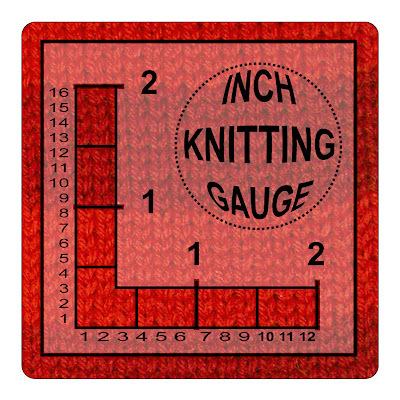 Next, you measure your gauge, both row and stitch gauge, using a tape measure or a gauge meter specially made for knitting. If your stitch gauge is off, you switch needles, and try again For too MANY stitches per inch--7 st/in, instead of the 6 st/in you want, for example, knit another swatch, using LARGER needles. For too FEW st/in, re-knit using SMALLER needles. The same idea goes for row gauge; If you have TOO MANY rows per inch, use a larger needle, if you have TOO FEW rows per inch, use a smaller needle. All this is clear enough (if dull) but now can come trouble: it often happens that when you finally get the STITCH gauge correct, then the ROW gauge is off. The fact is, fixing this so they are both correct is truly a BIG problem; beyond the scope of this post. The beat answer is to knit items where ONE of the gauges DOES NOT MATTER. Often, the ROW gauge is immaterial, because the measurements are given in LENGTH (inches or centimeters) rather than being expressed in row count. For example, the instructions will say "knit 48 rows or until piece measures 6 inches." If, for example, the row gauge for the pattern is 8 rows/inch, but you are getting 7.5, simply knit until you get to 6 inches (45 rows, instead of 48). Even if the instructions aren't written using length measurements, you can use math in this way to figure it out. There are also knitted items where the STITCH gauge does not matter, or at least, does not matter very much-- scarves, afghans, pocketbooks--items which not fitted to the body. However, some garments (including these pocket hats) also aren't crucial as to gauge. 1. 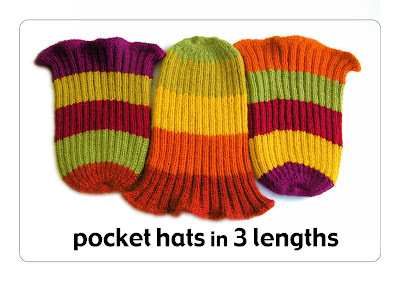 The pocket hats have been test-knit in three lengths. Your hat is most likely to end up somewhere in this range, and you can say that you meant to make it in that length all along. 2: the final length on these hats can be adjusted by unraveling and re-knitting the top. These hats are knit in stripes and all the shaping happens very suddenly, all in the top color. Because the top is not actually a "stripe" but is actually a big "spot," it can be made a different number of rows than the preceding stripes, without ruining the look of the hat. The STITCH gauge is not exactingly important with pocket hats either, because these hats are made in 2x2 ribbing (k2, p2). Ribbing is SO stretchy that specifying a gauge is difficult anyhow. Should the ribbing be stretched when measured? How stretched? Ironed flat? If not stretched, then how "unstretched" should the sample be when measured? The only real answer is that when a garment is made in ribbing (or any other heavily textured fabric) the pattern should provide a stitch gauge in stockinette. The theory behind a stockinette gauge swatch for a ribbed garment is that if you can match the stitch gauge of the original creator in stockinette, you will match their gauge in ribbing too--not a great assumption, perhaps, but all that we have. And there is one surprising thing about a stockinette gauge swatch: although the number of stitches per inch varies substantially between stockinette and ribbing, the ROW gauge is accurate and can be read off directly from the stockinette swatch to the ribbed fabric of the hat: on the photo below, each ribbed hat stripe (left) is 16 rows high, each stockinette gauge swatch stripe, 8 rows high, and the stripes line up 2-for-1 perfectly. 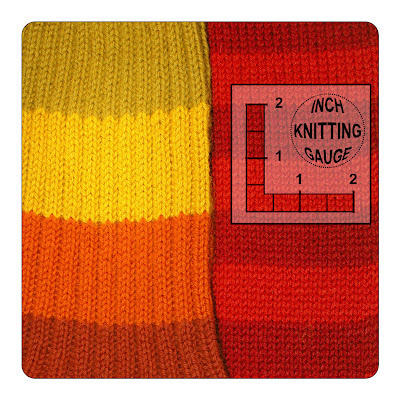 In other words, the row gauge is identical across the two fabrics, regardless of the variation in the stitch gauge from the textured hat fabric to the smooth stockinette gauge fabric. These hats are knit in a DK weight of yarn. Each hat has 5 stripes, and each stripe uses about 1/3 ball of a 50 gram ball. In other words, 5 balls will make about three 5-color hats. The yarn used is Dale of Norway HEILO yarn, in a grab-bag color assortment of colors (truthfully, in left-over scraps.) Heilo is a long-staple yarn, reasonably tightly spun with excellent durability and a wide color range, in a DK weight and excellent for utility knitting: the garments look as good at 5 or 10 years of age as when they came off the needles. Heilo is hand wash, however. If you want to make this same hat in a machine washable wool, consider Dale's FALK yarn: same yarn as Heilo, but superwash. Heilo (and Falk) are relatively ITCHY wools, and the last tricks in this series deal with how to tame the itchy-wool-on-forehead syndrome. They are also fairly coarse wools. For the reasons above, the HAT is knit in 2x2 ribbing (k2, p2) but the GAUGE SWATCH is knit in stockinette. The swatch has 12 stitches/2 inches (same as 6 st/in), and 16 rows/2 inches (same as 8 st/in). In the photo just below, see for yourself. Two last notes to swatchers. 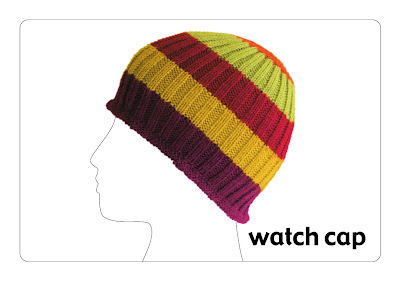 1. the hat is knit in the round, so the gauge swatch should be also. Click here for a trick to make that faster and easier. 2. The swatch here, as well as the hats, were dressed before measuring by a light steam blocking. Click here for more info on steam blocking. Bottom line: make your swatch in stockinette, to match as close as you can: 6 st/in OR 8 rows/in (if you get pretty close to both row AND stitch gauge, bonus points!) Next time we'll cast on with the nifty reverse stockinette easy-peasy rolled cast on.